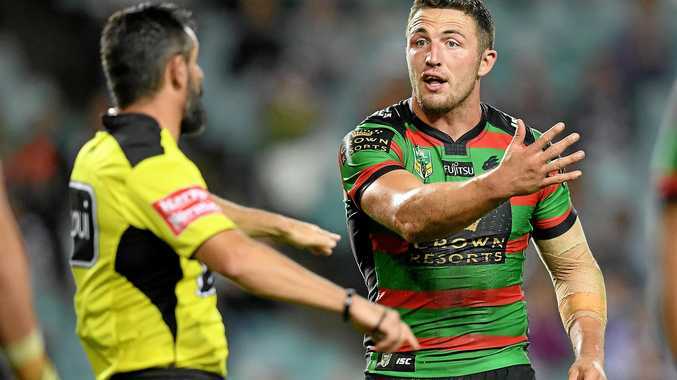 SAM Burgess has reached double figures for NRL matches missed due to suspension, putting his on-field judgement under the microscope amid a spate of recent match review charges. South Sydney's English enforcer will miss the upcoming clashes with Brisbane and Newcastle after his latest transgression. Burgess entered an early guilty plea on Monday for his high hit on Canberra's Aidan Sezer. It was Burgess' fourth charge from the match review committee in his past seven games and the 13th in his seven and a bit seasons in the NRL. Of those charges he has only ever been cleared once at the judiciary - for an alleged shoulder charge last year. 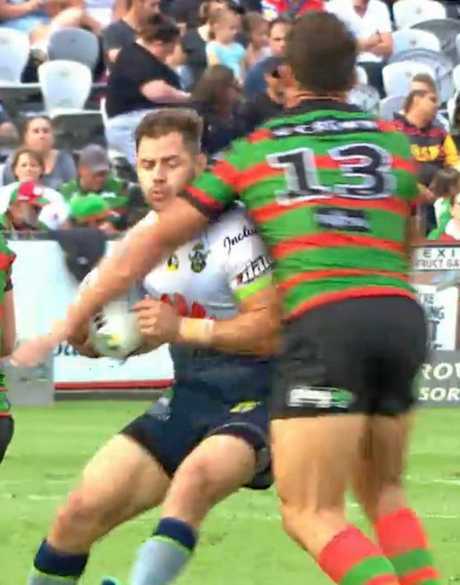 The hit on Sezer, which sparked an all-in melee in Souths' 20-point win over the Raiders on Saturday, came in Burgess' return match from a two-week suspension for a dangerous contact charge on Canterbury's Josh Morris. Burgess is one of the most passionate players in the NRL, but his rap sheet shows he at times crosses the line into ill-discipline. The recent offences are grossly counting against him in weighting and carryover points each time he cops even a minor charge. In total, Burgess has now been suspended for 10 NRL matches since his first ban in 2012, with four careless high tackles marked against him as well as charges for a crusher tackle, chicken wing, genital grabbing and cannonball. The suspension will come at a crucial time for the Rabbitohs, who appear to be hitting form and could have had a significant big-man advantage against the Broncos on Thursday night. Meanwhile Souths also confirmed Sam's brother George has accepted a $1550 fine for a high tackle on Canberra's Luke Bateman.